Description : Soya Protein Hydrolysate 48% 24 gm, DHA 100 mg, Dicalcium Phosphate 1330 mg, Vitamin C 83 mg, Nicotinamide 50 mg, Elemental Ircn 30 mg, Vitamin E 17 mg, Zinc Sulphate 5 mg, Vitamin B2 4.5 mg, Vitamin B1 3.3mg, Calcium Pantothenate 3.3 mg, Vitamin B6 1.6 mg, Copper sulphate 1.6 mg, Folic Acid 1 mg, Manganese Sulphate 10 mcg, Vitamin K 60 mcg, Vitamin K 60 mcg, Vitamin B12 1.7 mcg, Vitamin A 53331. U, Vitamin D3 333 I.U. Calcium & Vitamin D3 - Develops strong bone & teeth of child. 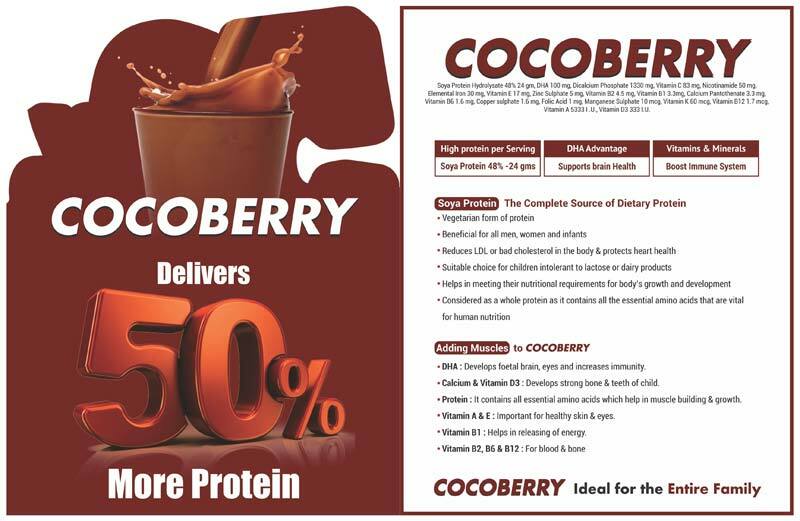 Protein - It contains all essential amino acids which help in muscle building & growth.